He started by introducing himself with the help of identity markers, that we ourselves would later also use. With dual bachelor and dual master degrees and a PhD in the near foresight, one of Narku’s identity markers was obviously that he is a scholar. He expressed that his ethnicity, political engagement, HIA involvement and citizenships also formed large parts of his identity. After this short introduction, he asked three volunteers to be in charge of big sheets on which we would write our expectations for the day, the topics we would like to discuss and the potential conflicts we would be facing. The first exercise was an awareness exercise. We were shown a video of two basketball teams and were asked to count the number of passes the white team made. While the majority of us was right in answering 13 passes, not one of us had seen the moonwalking bear that appeared in the middle of the video. As we were too focused on the question or the thing we were supposed to be looking for, we failed to see or notice anything else. Most interestingly, Narku told us that this exercise almost always fails with 7/8th graders, as they don’t yet listen to authority and not always follow the given instructions of what to look for. 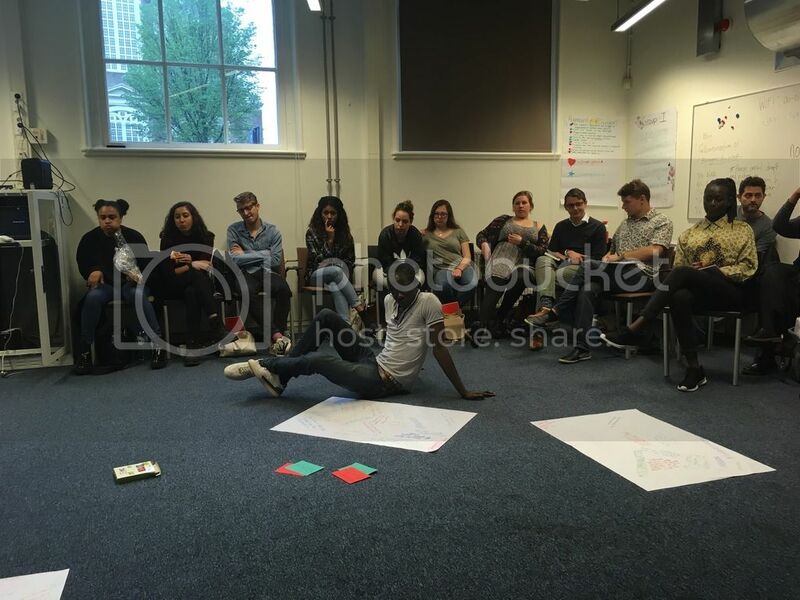 Subsequently, we did an identity exercise in which each of us had to write down 3-5 identity markers that made us “us,” such as racial ethnicity, gender, sexual orientation, hobbies, familial or friend roles, etc. 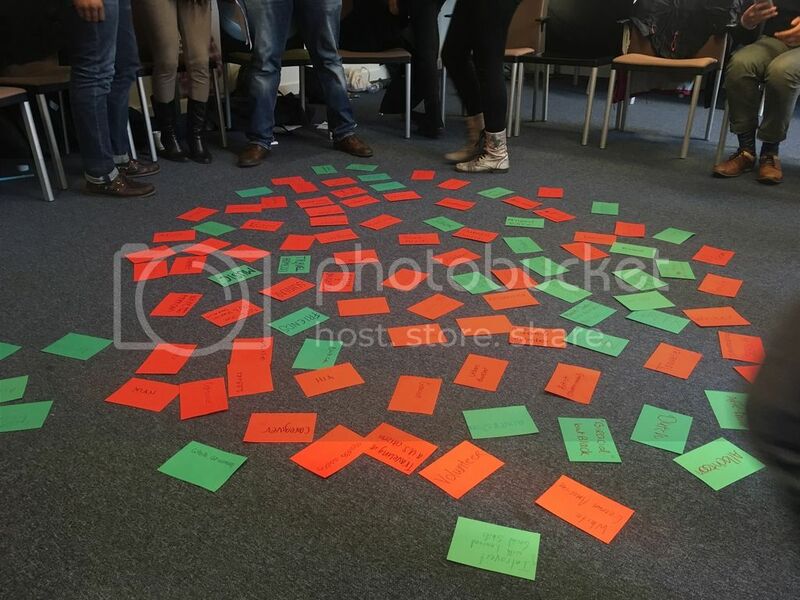 After each of us had written them down, we formed a circle and each put our identity markers down in the middle, either shortly describing/explaining the card or just reading them out loud and putting them down. After each of us had done so, Narku explained certain patterns he sees in every workshop he gives, such as that people with a racial minority often write down their religion and that Caucasian people are less likely to use one of their 5 markers to write down their ethnicity. With all the identity markers in the middle, Narku asked us to pick one, turn to the person next to us and tell them a positive story we’ve had with this part of our identity. It was nice to do so in smaller groups, as people felt more open to share their personal stories one-on-one. After sharing these positive stories, Narku asked us to recall a negative story with the same identity marker, concluding that every identity marker is double sided. Then we got back into a circle and step forward with a feeling we had. All people that resonated with what the person stepping forward had said, would also take a step toward the middle. Things like “I’m tired of being the positive example,” “I wish I had a better relationship with my father,” “I always take more care of people around me than of myself,” “I have difficulties opening up,” and “I feel like I have to overcompensate because of the color of my skin” came up. After lunch we did an anti-bias exercise: the “Ice Berg of Diversity” exercise. 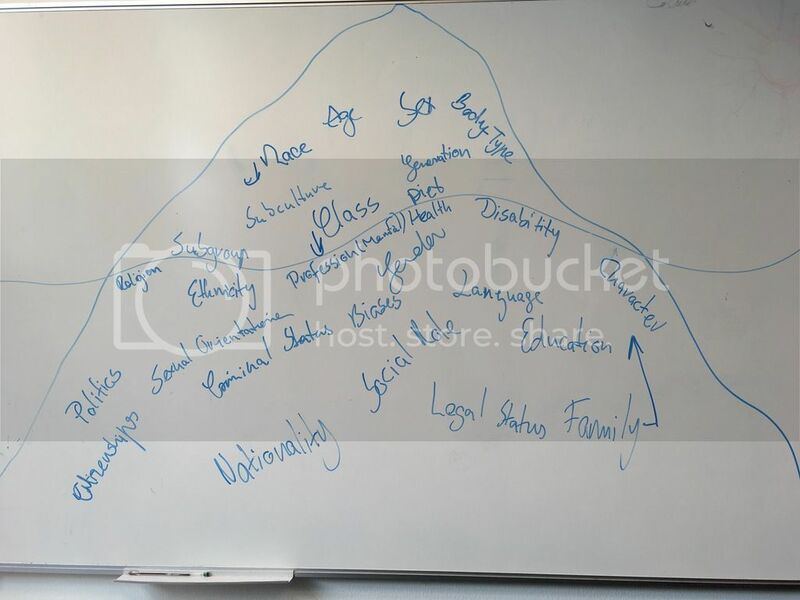 Narku drew an iceberg on the board in which the visibility of identity markers was underlined. This exercise functioned to show us which identity markers (such as race, gender, class, etc.) are visible “above water,” which ones float right below surface, and which ones are deep below water level. Narku discussed theory with us, explaining the differences between diversity, group-focused enmity, and inclusion, and social justice, empowerment and representation & democratization. 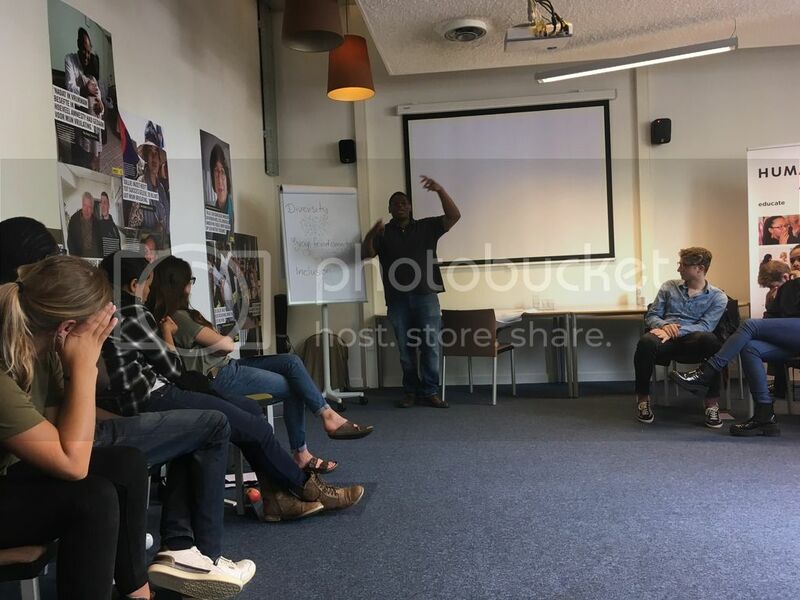 After this quick theory class, we put it in practice by forming two circles, an inner circle and an outer circle, in which we practiced reacting to discriminatory situations with the person standing opposite you. By way of illustration, situations included a woman with a headscarf being singled out by the police, a woman being interrupted continuously by a man at the dinner table, and a person within the family making racist remarks. Between the different exercises, Narku showed us several videos. One of them was “Where Are You From?” The video displays a white middle aged male and an American-born woman of Korean descent in a park. The white male asks the woman where she is from. The woman answers “San Diego.” “No, but where are you really from?”, the man asks. “San Diego.” After a short interaction, she tells him her grandparents were from Korea, to which he reacts: “O my god, I love Korean food” and most inappropriately imitates a number of culturally Korean-won phenomena. As a micro-revolution she reacts by asking him: “Where are YOU from?” “Oh I’m just from the United States. San Francisco.” “No,” she asks, where are you REALLY from? “United States, born and raised.” Finally, he tells her that his grandparents were originally from England, to which she responds the exact same way he did, imitating all these inherent British things, in a slightly overdramatic way. He doesn’t get it and just says “you’re weird” and runs away. The last exercise before reflecting was a conversational, discussion exercise. All chairs were placed in a circle with three chairs in the middle. If you wanted to participate in the conversation and say something, you had to sit in one of the chairs standing in the middle. First we discussed safe space. Then the questions “Can we ever have an honest discussion about race?” and “How limited is empathy?” were asked. We closed off by discussing anti-discrimination and identity politics. After a in-depth reflection, we moved outside for Louis’ great fellow talk that was about belief and religion. He told us how he regained his belief in G*d after fearing to have lost it for a bit. Obviously a difficult subject to tackle/crack in 30 minutes, we had a lot to discuss even after the talk had ended. Aletta’s talk on criminalizing dissent addressed one of the largest challenges posed to parliamentary democracy, the treatment of subaltern voices and the limits of free political expression. She stressed the fact that our process of criminalization was not neutral but rather a product of intersecting social, political and legal context which results in the once demonized queer population of Greenwich village in the late 1960’s now being hailed as the modern day champions of the LGBTQIA+ community all across the world.